This is basically a crescent roll, all twisted up so it’s easy to tear and eat. Scroll me straight to this easy recipe! This recipe was really an attempt to make something else. When I went to Bulgaria with my sister, we stayed right next to this awesome little bakery with all kinds of bready concoctions. They were very easy to grab and go, so we would buy two of them in the morning and split one for breakfast and the other one later for lunch, all for about $3 total. I love being able to travel on the cheap so it was wonderful traveling with someone that wasn’t married to 3 squares a day like El Gallo. Back to the breads, they were all folded in different variations, mostly with feta in them, and one of them was even this ham and cheese sandwich thing with a pickle on it! Genius. So I come home and think hey, I’m gonna try to make something like that for my blog. Naturally. Well, my willing associate (who was very likely rolling her eyes at the process of making bread again) suggested we try it by using crescent roll bread instead. So we made two different types. 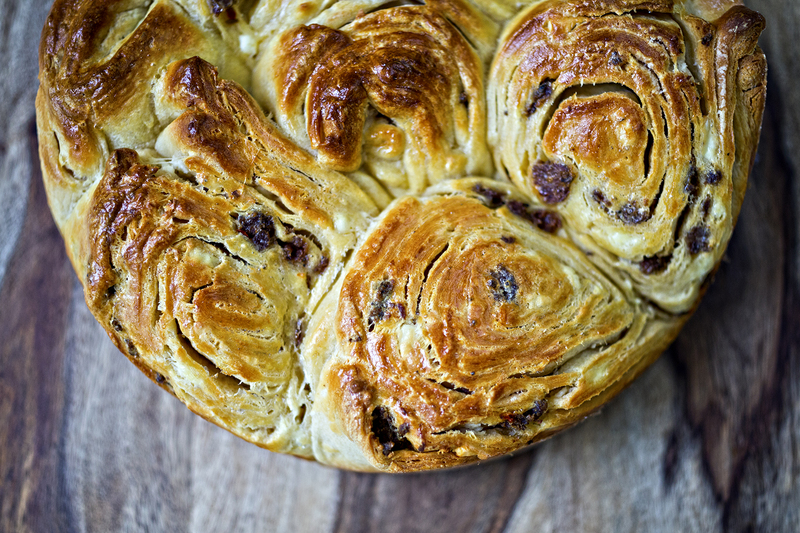 One with one of the sort of big, thick rolls (kind of like cinnamon roll shaped) with feta and ground venison, and one with the sort of take on “ham and cheese” though using a different dough-bending technique than a simple fold-over. Not that crescent rolls aren’t magical in their own right, but the one, while very pretty, basically turned into one big giant crescent loaf. It was all so dense that I may never eat a crescent roll again. But isn’t it pretty? After that point you twist each arm into the center and bake it. It really makes a great little bread that you can set down and people can tear pieces off. Good to set out for the holidays either on the dinner table, or pre-meal to keep people from hovering as you finish cooking. Preheat the oven to 350, or according to package directions. Open your cans of crescent rolls and squish both rolls of dough together until there are no more perforations and they are incorporated into one dough ball. On a lightly floured surface, roll the dough into as thin of a circle as you can. The dough will try to bounce back some, so just work with it and do your best. 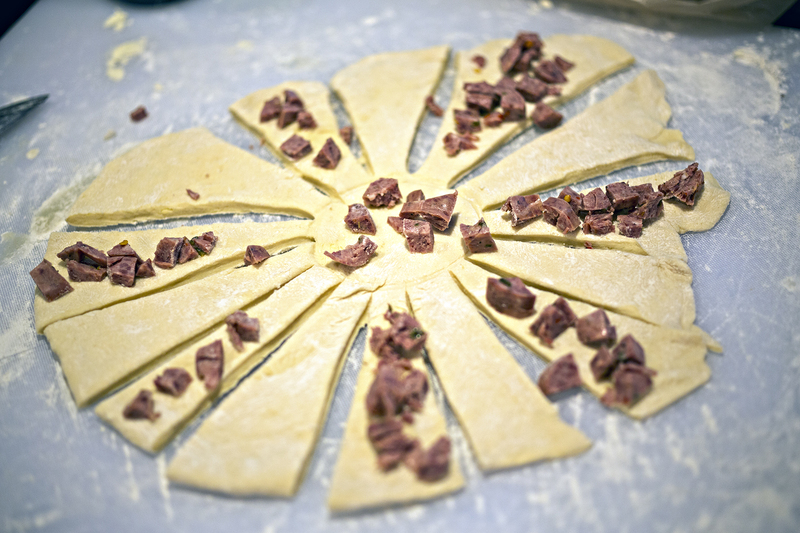 Once in a large circle, take a glass with a relatively small mouth and press a circle in the middle of the dough circle. 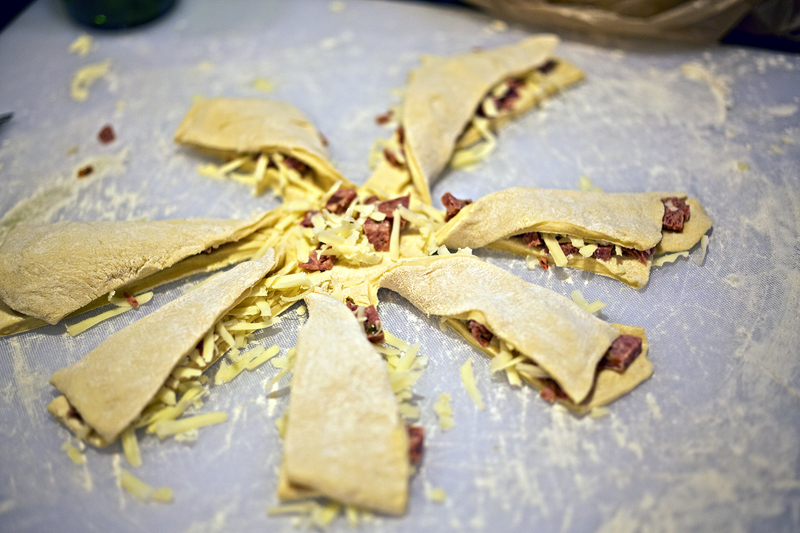 Then, make slices in the dough diagonally out from the circle, creating an even number of wedge pieces. (Dough will now look like some kind of Aztec sun.) Put some cheese and sausage on every other wedge. Fold one wedge (or arms, if you will) that does not have sausage and cheese on it on top of one next to it that does and press together and twist, curling the section into the center and pressing so it stays. Repeat this process with each set of wedges. Put the whole loaf on a baking sheet lined with foil (for easy cleanup) and bake for about 15-20 minutes, or until the top of the loaf is golden and the dough is cooked all the way through the center. Non game substitution: Any meat that’s cooked and good chopped up small will do, like diced ham, or smoked anything. Vegetarian substitution: Just leave out the meat and make cheese bread! 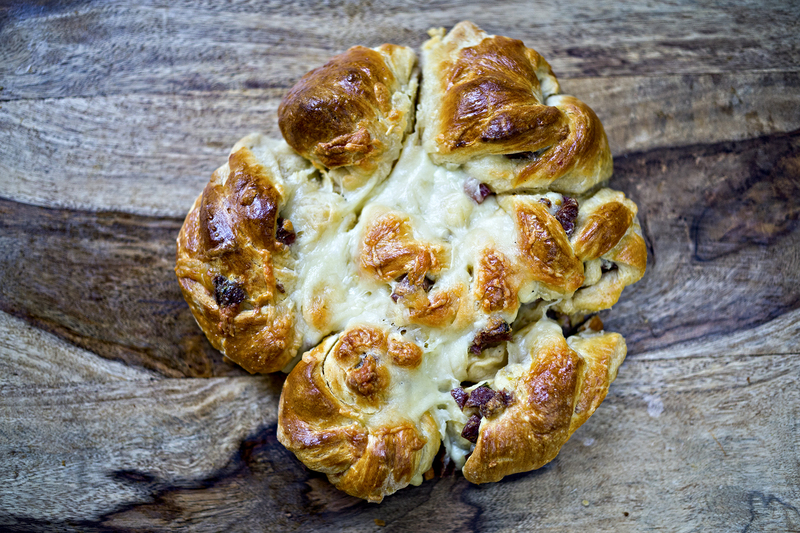 Mmmm… cheese bread.